Saturday‚ September 23rd was full of possibility. I was in New York City for the first time in years. I had spent the afternoon at the MoMA with a friend‚ soaking up ideas and admiring beautiful‚ sophisticated city women. And now‚ I was in Greenwich Village for the first time. I was in this dirty old city to run a bit of an experiment: in the course of one evening‚ the evening of John Coltrane's birthday‚ I was going to see the McCoy Tyner Trio with special guest Pharoah Sanders play a set at the Blue Note‚ with drummer Bobby Previte and keyboardists Brian Haas and Marco Benevento scheduled to play a late night set after them. I admit to not having a deep knowledge of jazz: in fact‚ I was running mostly on what I had read and heard about all of these musicians. Names and stories led me to this night-though my aim was true: I wanted to hear these people play. The house was overflowing‚ and though we didn't have to wait in line‚ we found ourselves stuck standing at the bar‚ looking down the length of the narrow club: dozens of tables covered the floor‚ in turn covered with drinks and dinner plates‚ all surrounded by people laughing‚ telling stories‚ flirting and waiting for the show. 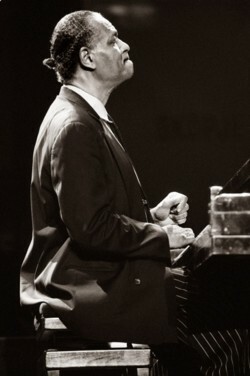 By the time we were holding drinks ourselves‚ the house lights dimmed and a perky female announcer asked us to welcome the McCoy Tyner Trio to the stage. A calm‚ contemplative man dressed impeccably in a dark suit descended the stairs‚ turning left into the packed dinner audience. His hair was pulled back in a tight little nub at the base of his neck. He slowly and graciously shook a hand or two as he made his way to the stage‚ taking his place at the room's Steinway grand. His rhythm section looked to him‚ ready to play. The trio started in on a tune that Tyner later mentioned he had written for Coltrane‚ whom he acknowledged in a reverent tone as his "friend and teacher." After a couple of numbers‚ the pianist invited tenor legend Pharoah Sanders onto the stage. As much a towering presence in the story of mid-20th century jazz as Tyner‚ Sanders was another artist I felt blessed to have the chance to see in person. This was where things began to get difficult. Though there were moments when the band cooked-especially the rhythm section‚ which seemed to try and spur Tyner and Sanders to more dramatic heights-I felt underwhelmed. The set ended somewhat abruptly‚ after only 50 minutes of music (though a guy I spoke with minutes after the set ended said that was normal). As the crowd started to thin out‚ I was stunned and felt a bit confused. I had seen these two legends play‚ but somehow I felt I had missed something. With all due respect to the artists‚ and excepting some of the more searching material‚ I felt I had essentially seen a quartet run through a set of bebop standards-a set of compositions (some familiar enough that I could whistle them; some newer and unfamiliar to me) that have been played off and on for nearly 40 years. There are so many questions here: of form‚ intent‚ history‚ and personal perception. I wouldn't be surprised if I missed the point‚ but for me the music being played was very safe‚ very much part of what these men have been doing for decades. A statement of where they are now-as aging legends. The playing was deep‚ eloquent‚ with moments of sublime beauty‚ but it all felt limited. Like I could see into a room‚ but could not enter it. They showed me part of their souls‚ but kept most of it back. I think when this music was new‚ over 40 years ago‚ it would have knocked me out. But now I was looking back through these men‚ not forward. Then there was the harsh reality of commerce‚ that just made the end of the set more jarring: as Tyner and Sanders were each gently leaving the stage‚ before their feet left the bandstand‚ the perky announcer let us know that if we liked what we heard‚ CDs were available upstairs. Not only had I seen staff pack every single person possible into the club at the going rate of 45 dollars per person‚ but on the birthday of perhaps the most important tenor saxophone player of all time‚ at a show to commemorate him‚ I was being sold merchandise before I could even have a moment to consider what I had just seen. Within minutes everyone was back to conversation and drinks. If you had just walked in from the street‚ it would be hard to tell that anything had happened. Frustrated and confused‚ my friend and I met up with another good friend-who had just caught Factotum rather than stand at the Blue Note bar for 30 dollars-and stepped into a dark‚ sympathetic Belgian beer bar for a brown and a blonde. We discussed the situation and our chances for better luck with the late-night set. After fortifying ourselves with strong‚ honest beer‚ we went back to the club‚ in hopes that our confused-looking‚ smartly dressed young friend at the door could get us a prime table for late-night. Luckily‚ he just waved us in (looking flustered as ever)‚ and we planted ourselves at a table 15 or 20 feet back from center stage. The dinner crowd had dispersed and the feeling in the room had changed. All the expensive outfits and their dates had left. Within minutes‚ Bobby Previte was adusting his drumkit and Marco Benevento was sound-testing his keyboards and circuit-bend toys. After ten minutes of simply hearing these guys adjust their instruments‚ my friend looked over at me and said‚ "This is already better than the first show." And he was right. God was he right. He was right in the way that a person is right when they go out on some mediocre dates‚ then meet someone who lights them up with the wildest inspiration‚ like the world is exploding in Technicolor every single minute. Let me get this straight for you: what I saw during the 10:30 set was two men who were once on the forefront of a progressive movement in jazz; the kind of things they were doing‚ the music they were writing‚ the way they improvised and soloed‚ their ability to fly along at breakneck speeds and weave in and out with each other while creating harmonies that would make old ladies howl and young cats swoon was unparalleled. But at this point‚ they sounded very polite‚ very reverent‚ and for the most part‚ set in their ways. They didn't have anything new to say. I want to approach this with all due respect‚ but the truth is‚ I wasn't touched by their music. Now‚ let's talk about the 12:30 set. Bobby‚ Marco‚ and Brian got up there onstage. Bobby started talking to Brian‚ saying things like "Let's start with '14‚' okay? Yeah‚ 14…" He kind of smirked and looked at Marco. They talked a little more‚ all with smiles‚ and Bobby finally concluded‚ "Yeah‚ then let's‚ let's end with '2.' Okay‚ so '14' and‚ uh‚ you know‚ end with '2.'" They all kind of agreed and laughed a little bit. Bobby started playing a few notes on a cymbal; Marco squeaked a few out of a keyboard. Brian picked it up‚ turned it a bit‚ and suddenly they were exploring this little thing they made. Brian started turning it a bit more. Bobby pushed it‚ adding a little pulse. Marco played a chord‚ held it‚ tossed a few notes in. Slowly‚ it started to cook. With Marco and Bobby weaving together this dirty little groove‚ Brian found himself a spot inside it and started jabbing at the keys on his Rhodes. His upper torso began to move back and forth like it was on a hinge‚ and his head led the way‚ pushing down toward the keys and pulling back up as the rhythm he threw around became more and more assertive. He started talking to himself‚ letting out a shout at Bobby as they started to build. Marco started playing thick‚ heavy‚ bass notes on a keyboard off to his left‚ as his right hand started to paint a bent-up‚ distorted wash over Brian's staccato Rhodes onslaught. Suddenly we had music. I looked at my companions and smiled. And to my unrivaled pleasure‚ '14' didn't stop for about an hour. What we saw was three men who were so full of ideas‚ so full of energy and music that they screamed‚ pounded‚ tore‚ suggested and whispered through over 60 minutes of completely improvised music so remarkable that it made the last several shows I've seen look like the work of people who are‚ to put it mildly‚ fussy. This was unbridled. This was expansive. It was the work of three minds‚ three bodies‚ six hands‚ and several feet doing exactly what made sense in the moment‚ constantly‚ for over an hour. No one said‚ "No‚ you can't do that." No one waited until after the head to start soloing. There was no polite clapping after a solo. There was never‚ for a moment‚ a shortage of wildly inspired music. During certain passages Marco would get up from his electronic playground and sit behind the grand piano‚ often looking like a determined madman. At one point‚ the trio got to such a fevered-pitch crescendo that Marco was using fists to build run bursts of sound up and down the keyboard‚ hair flying‚ eyes focused on the keys‚ ears wide open. At other times‚ Bobby would start laying heavily into one of the electronic drum pads in front of his snare drum; these were some of the moments during the show when he looked happiest-his eyes glued shut‚ a huge grin on his face‚ a large vein in his neck easily seen from the crowd‚ his cut biceps accented in the spotlight. Eventually they found a natural end to what they were saying. The music calmed and dissipated. Then it started up again. It was like they were saturated with music and had to vent some of it off. And they did. At one point‚ about 40 minutes in to the second section‚ Marco was seated at the piano. He started playing something that sounded like a nice little blues‚ inserting a familiar form into the freedom around him. Slowly Bobby and Brian heard him and started moving in his direction‚ though only suggesting what could have been done. Brian started playing more bass and creating more space. Bobby gradually moved from sticks to mallets‚ then finally to brushes. The focus was on Marco and what he was saying. The room became more and more quiet. Finally‚ Bobby and Brian were hardly playing at all. As the music settled‚ to near silence‚ Marco stood up‚ reached into the piano‚ and started running his fingertips across the piano strings‚ making soft‚ metallic‚ brushing sounds. After a moment‚ he plucked one string after another until he had a graceful melody. Then he reached over and tapped one very high note on the keyboard‚ leaving us in anticipation. Brian answered him with the perfect bass note to resolve the whole thing.